...... for easy or professional video editing. Doremisoft Mac Kodak Video Converter can convert Kodak video to MP4, 3gp, 3g2, mpeg1, mpeg2, mpg, flv, swf, wmv, dv, m4v, mkv and more video formats, and convert Kodak video to mp3, aac, ac3 and more audio formats. This Mac Kodak video application also works at an excellent Mac Kodak video editor and allows you to crop and multi-trim your Kodak videos, adjust video brightness, contrast and saturation, and merge Kodak videos into one file and so on. Doremisoft Mac Kodak Video Converter is the best Kodak video camera partner for Mac users to share their Kodak MOV videos from Kodak Zi8, Kodak Playsport and Kodak Mini video camera etc. on all kinds of different players, web and in various video formats. Qweas is providing links to Doremisoft Mac Kodak Video Converter 3.0.1 as a courtesy, and makes no representations regarding Doremisoft Mac Kodak Video Converter or any other applications or any information related thereto. 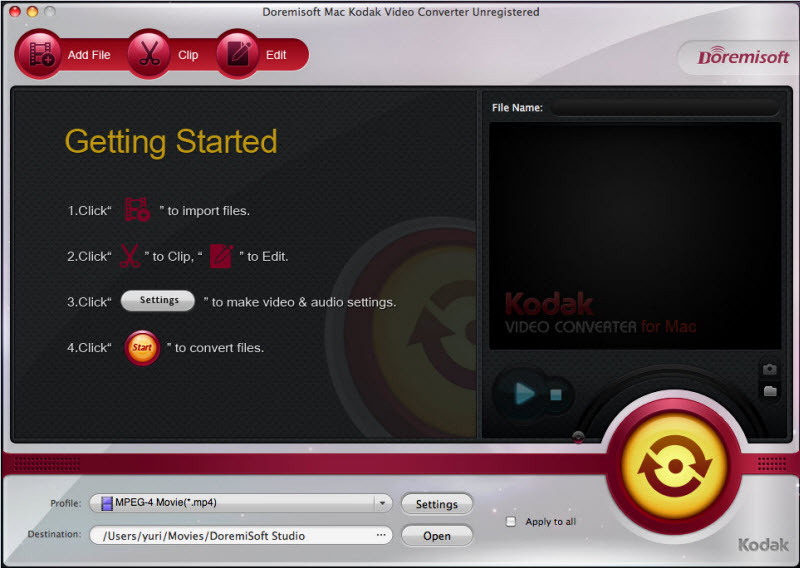 Any questions, complaints or claims regarding this application Doremisoft Mac Kodak Video Converter 3.0.1 must be directed to the appropriate software vendor. You may click the publisher link of Doremisoft Mac Kodak Video Converter on the top of this page to get more details about the vendor.